Emergency Number Day was proclaimed by President Ronald Reagan in 1987. This observance focuses on the United States public safety communication. Three-digit emergency telephone numbers originated in the UK in 1937. The emergency telephone number used in the United States was created by the Federal Communications Commission and AT&T in 1968. The combination 9-1-1 was chosen because it was brief, easy to remember and dial. 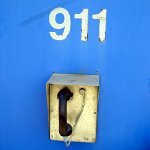 The first 9-1-1 call was placed on February 16, 1968 in Haleyville, Alabama. In the same year 9-1-1 officially became the national emergency number for the USA. However, it became widely known only in the 1970s. All 9-1-1 calls are answered by special call centers known as public-safety answering points (PSAPs). Calling this number provides callers access to police, ambulance, and firefighting services through trained dispatchers. 9-1-1 Emergency Number Day is observed on September 11. This date was selected because the numbers 9-1-1 correspond to September 11 in the month-day date format. Since 2001, the importance of the Emergency Number Day has declined due to the 9/11 terrorist attacks and subsequent proclamation of Patriot Day as a national observance.